We’re excited to announce the availability of the new Office desktop applications for nonprofits through the Microsoft software donation program. Eligible nonprofit organizations and public libraries can order software through our nonprofit partner, TechSoup Global. Get started today. Features of the new cloud-integrated Office allow you to access and edit your documents using Word, Excel, OneNote, and PowerPoint from any computer, including touch enabled devices, whenever and wherever you want. One of the first things you’ll notice with the new Office is a new start screen. 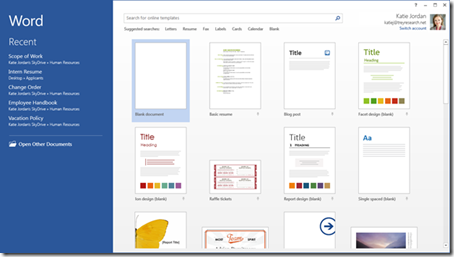 The start screen enables you to easily reach recently opened documents or get started with a template. The start screen also allows you to pin your favorite folders and locations, so they’re always available. Additionally, you can connect to services, such as Facebook, Flickr, or YouTube to get images, videos, or files and easily insert them into your document or presentation. There’s also easier file sharing. If you have an account on SharePoint or Microsoft SkyDrive, you can save your files to one of those places, then use the “Share” command to let others read or edit your copy of the file. It’s a simple solution to maintain one copy with everyone’s edits. 1. Find out how you can order the latest version of Office for your nonprofit. 2. Join our #Office4Good TweetChat on Wednesday, January 30th @ 12pm PST with special guest Doug Thomas, the Office Casual guy. He'll give productivity tips and highlight his favorite features. This is a great opportunity for nonprofits to ask questions and get advice from one of the experts. We'll also share how nonprofits can get donated Microsoft software through our partner TechSoup. Join the conversation using the hashtag #Office4Good. 3. Register for the new Office webinar on Friday, February 1st @ 2:00pm EST/11:00am PST, hosted by TechSoup. David Alexander, Product Marketing Manager on the Office Technical Marketing Team, will demonstrate the new Office and answer questions from nonprofits. 4. Spread the word! Tell your favorite nonprofit about Microsoft’s software donation program and encourage them to visit www.Microsoft.com/nonprofit. 5. Follow us on Facebook and Twitter to keep up-to-date with the Microsoft software donation program. If you have a favorite nonprofit let them know how they can get a software donation from Microsoft.